Shop4teams is the #1 online source for adult warmup pants, track suits, athletic clothing and apparel. We have been designing quality embroidered and screen printed clothing since 1985, providing customized team apparel for countless athletic organizations, schools, companies, clubs and non-profit organizations all over the world. Our customers have come to expect the highest quality from us, especially when it comes to custom warm-up pants. 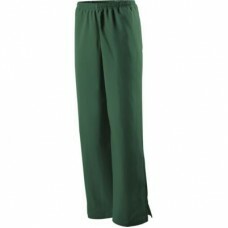 If your team needs a new set of team warm up pants for the upcoming season, then there’s no better place to look than right here. Size chart Agil-Knit™ is a 100% polyester brushed tricot with a peached finish * Ladies' fit *.. Colors: 50% cotton/50% polyester * Oxford: 52% polyester/48% cotton * Dri-Power® Moisture Wicking Te.. Size chart Dry-Excel™ Sof-Stretch™ fabric made with 90% polyester/10% spandex * Metallic .. Size chart . Dry-Excel Elite Performance Pique has a textured polyester surface with high mecha.. Size chart . Wik-Sof dry-Excel Performance Fleece has a smooth polyester surface and dries.. Size chart . Micro-Cord shell provides wind and water-resistance . Mesh and nylon liningEasy-en.. Size chart . Stealth-Tec fabric acts like a knit but performs like a woven . Medium weight poly.. Size chart . Stealth-Tec fabric feels like a knit but performs like a woven . Medium weight pol..
Limited quantities in stock. Please call for availability. Size chart Swif-Tec™ doub.. Size chart . Duraweav fabric has a smooth oxford nylon surface and medium weight to provide a d..